All visitors to the Island are required to purchase a day pass with the National Park Service (or use your annual park pass if you have one). The island is only 10 miles in circumference, easily a day hike for most people. For the day-tripper, you can either order sandwiches “to go” from one of the shops in Fishtown, or pack a picnic with snacks and treats to last the entire trip. Once on the island, you won’t have an opportunity to purchase food or supplies and the last modern restrooms are near the old boat house and ranger station. There’s also a place to fill up your water bottles just outside the bathrooms. After that, your best bet for replenishing drinking water while exploring the island is at one of the three campgrounds – but you may want to invest in a water filtration system just in case. If you are only spending the day exploring South Manitou Island, keep an eye on the time. If you miss the 4pm departure back to the mainland, you’ll need to find a park ranger in a hurry. If, however, you’re craving some longer-term quiet relaxation, take a hammock, get a beach-side campsite, and enjoy a very relaxing and pristine week under the stars. Just be sure to register at the boathouse ahead of time. The island was once known for the purity of its seed crops as well as lumber and fishing, and there are many popular excursions. One is a stand of old growth cedars; among the largest and most magnificent in the entire state of Michigan. The western edge of the island is flanked by a wall of sand dunes towering over 300-feet in elevation. If you are looking for sweeping and expansive views of Lake Michigan in the direction of Wisconsin, this is an excellent vantage point. To learn about the island’s early occupants, notable shipwrecks, and lifesaving efforts by the resident coast guard station, stop by the visitor center and new museum. 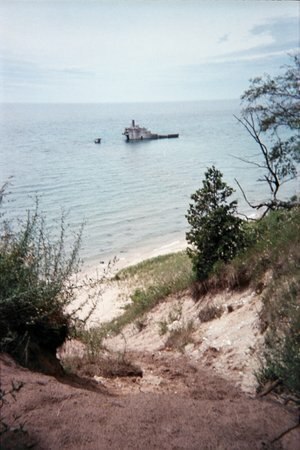 Both of these destinations are on the path/walkway leading out to the South Manitou Island lighthouse. Standing 104 feet above the shoreline, the light was once the primary means of protection as vessels traversed through the Mantiou Passage. The lighthouse tower is open between May and November. Park volunteers take guests up the 117-step spiral staircase and out onto the viewing deck. The South Manitou Island harbor is a wonderful place to swim. A favorite thing to do when visiting South Manitou Island is simply wade in the clear water and skip polished stones back into the shallows. For the hardier souls, bring your bathing suits and cool down with a swim in the island’s protected harbor. Bring your water shoes. Recent Zebra Mussel population spikes have left some of the shoreline of South Manitou Island littered with the shells of these little guys. Other tips for staying healthy on a trip to South Manitou Island include remembering bug spray, a hat, and any other light medical supplies (bandaids for blisters) that might make your trip a bit more comfortable. Know what poison ivy looks like and bring Benadryl/hydrocortisone cream if you know you will immediately react. Site #10 at Weather Station Campground has unobstructed views of Lake Michigan from a site perched atop a sand dune. It has direct access to the beach less than 20 yards down the sand and is very close to the potable water access and the restrooms. Best campsite on the island by far! What are your favorite sites on South Manitou?